26 Dec Live export buyers underpin WA prices. An expanded cross bench in Federal parliament has placed the ban on live sheep exports back on the agenda. Mecardo thought it an opportune time to reaffirm how important the live sheep trade is for WA farmers, particularly in terms of prices they receive at the sale yard compared to their east coast counterparts for lamb and mutton, when live export buyers are active. Price spread discounts for WA Trade Lamb and WA Mutton continue to narrow as live export buyers re-enter the market, bringing prices in the West Australian sale yards back in line with East coast prices. The WA Trade Lamb spread pattern to the Eastern States Trade Lamb Indicator (ESTLI) shows that reduced live export volumes through the winter period saw WA producers earning 230¢ less per kilogram carcass weight than East coast producers – Figure 1. However, since the re-entry of live export buyers into the final quarter of the season the spread discount has narrowed significantly for WA Trade Lamb, sitting just below what is normal for this time in the season at a 22¢ discount to the East coast. In a similar manner, WA mutton spreads to the ESTLI widened to a discount of 450¢ during late Winter as live export flows of sheep ground to a halt, well below what would be considered normal seasonal variation as identified by the grey shaded 70% range boundary – Figure 2. 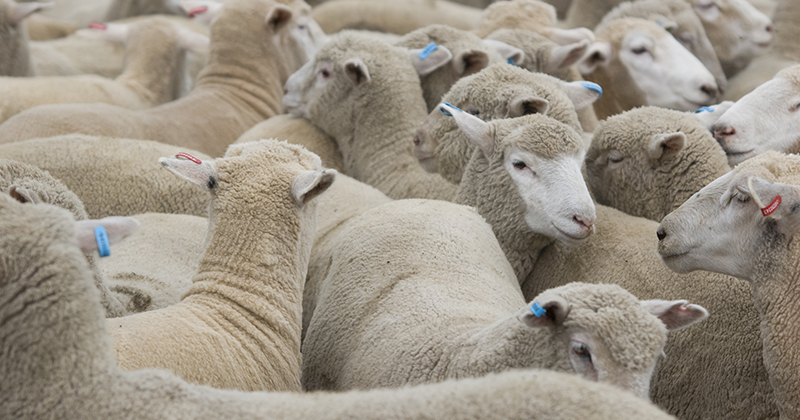 Increased activity of live exporters into the final quarter of 2018 have seen WA mutton spreads improve moving back into the normal range in recent weeks for the first time since July 2018. Comparing the average monthly spreads for WA Trade Lamb and WA mutton to monthly live sheep flows we can see a relatively clear deterioration in prices being achieved by WA producers, compared to the East coast markets as live sheep export volumes declined from May through to August – Figure 3. The relationship between live sheep export volumes and WA price spreads can be further demonstrated by the monthly correlation pattern between spreads and live trade volumes– Figure 4. Higher trade volumes clearly coincide with improved spreads for WA producers with WA mutton demonstrating a slightly stronger correlation coefficient (R2) of 0.6846 compared to WA Trade Lamb with a coefficient of 0.6164. What a difference a shipment makes. A reversal of fortune for WA producers. It is pleasing to see price spreads in WA markets normalize in recent weeks with the reintroduction of more sale yard competition in the form of live export buyers. Hopefully, as Federal members deliberate the bill seeking to phase out the live sheep trade they will pause to reflect upon how important the trade is to WA farmers and the industries that support them, such as transport, fodder suppliers, merchandise stores, etc. If those seeking to ban live sheep exports are successful it is likely just a matter of time before their target will shift toward the live cattle trade. What will be their next target if they achieve success here too? Banning intensive animal farming practices in the beef feedlot, pork, chicken and egg industries, banning long haul animal transport over land and/or any shipments of live animals overseas? It’s a slippery slope and for a member of parliament like Andrew Wilkie, representing the Tasmanian electorate of Denison, I wonder if his support for the banning of live export sheep overseas extends to the shipment of Tasmanian live sheep (and cattle) over the sea to the mainland? WA price spreads for Trade Lamb and Mutton have improved significantly since the re-emergence of live export buying competition in the last quarter of 2018. A strong relationship exists between live sheep export trade volumes and WA price spreads to East coast markets for Trade Lamb and Mutton.